With the holidays around the corner, I’ve been thinking about traditions. Whether it’s making Christmas cookies every year with my kids, drinking hot chocolate while we decorate the tree, going for late walks in the fog to look at Christmas lights, or letting the kids open a present the week before Christmas, I love doing things that make our family our family. Things that we look forward to every year. Which is why I’m posting this again from my archives. Years ago, my mother-in-law gave us this beautiful red plate as a gift. Apparently, among some early American families, when someone deserved special acknowledgement, it was tradition to serve them dinner on The Red Plate. I loved the idea and, right away, Mike and I started using the plate for birthdays. Then one time I decided to set it out when he got a promotion so we could celebrate. When our kids were no longer babies, we started using The Red Plate for them too… for birthdays…preschool graduations…the first day of school. This year, on Mike’s birthday, the kids and I surprised him and set his place for breakfast before he came downstairs. My daughter got a nice placemat, my son climbed up on the counter and got one of our fancy water glasses , and I set out the good silverware. “Get The Red Plate, Mommy!” they reminded me. Because, for them, the plate doesn’t just represent something to eat on. It represents tradition. And making someone feel special. 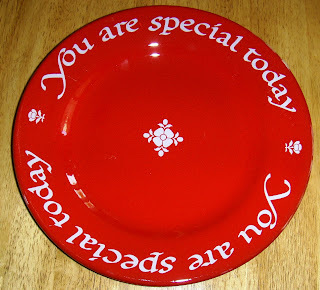 We even have two Red Plates now–one for our son, and one for our daughter. So that, many years from now, when our kids move out, I’ll be able to pack those plates up, wrap them securely in tissue, and send one off with each of them. And when I do, I’ll probably cry, remembering all the times we’ve used the plates, and all the memories they represent. What about you? Do you have a fun tradition in your family? I’d love to hear about it! If you haven’t already, leave your URL in the link list below so other moms can stop by your site. Just a simple way for moms to come alongside other moms. One of our traditions is buying a Christmas ornament each year. There was one year I didn't bother and I still regret it because as we hang the ornaments on the tree there are those that represent my children, their first Christmas and other special occasions. Although my ex and I aren't together anymore I still hang "Our First Christmas Together" ornament. One day I'll tell the children we have together what that Christmas was like. Sometimes the ornaments bring up specific memories and sometimes they just make me smile. Oh Genny, this post warms my heart!You must buy a third red plate so that when you have grandbabies (which, we know is a LONG way off!! :) But you'll have one to share the tradition with the next generation!Monday HUGS! Room for a "non-mom" to comment? Great post and great tradition. I agree, family traditions are so important. They build roots, security, foundation, and meaning. We have a number of them, but we never thought of Red Plates. But I think the idea is great.Thanks for signing up for the book give-away. I have a chapter in there (the chapters are short) on family traditions. Have a great Thanksgiving. And check back WEd for the winners.